Norton 360 - Comprehensive automated protection against viruses and spyware. 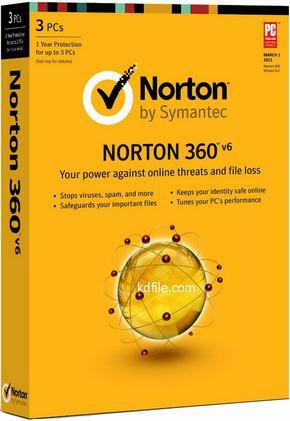 Norton 360 includes: antivirus, antispyware, firewall, data backup and system tuning. Norton 360 protects your computer, files, and identity, being the most rapid, complete and not demanding security products. • New. 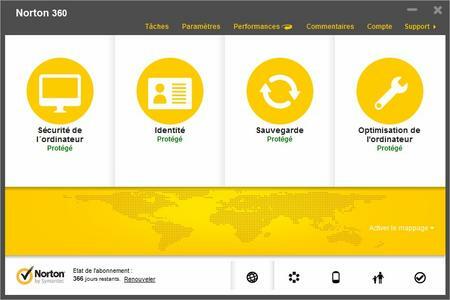 Norton Management: Based on Cloud technology management products through the Internet Norton, which you download, install, move, upgrade or renew the term of the license. Bandwidth control: Restrict non-critical updates Norton, when you are connected to a 3G network in order to avoid the use of traffic limit per month or exceed the cost of mobile communications. • Comprehensive protection: Protects confidential data, detects and removes viruses, blocks online threats, and ensures the preservation of important information. • Improved. Norton Protection System: Four unique levels of protection to proactively block the powerful online threats before they infect your computer. Norton Insight: Stops the new online threats before they cause harm, while at the same time, increases productivity by checking the source file and the time of their existence. Norton Download Insight 2.0: Protect your computer from malicious software before you install them, warning if they are malicious or unstable after the download is complete. Norton Safe Web: Proactively protects you while looking for information or visit the web-based resources on the Internet, alerting and blocking dangerous and phishing Web sites directly in the search results. Automatic Backup: Safely back up your photos, music, financial documents and other important information on the disk, USB-device or online on a secure server, Symantec. Norton 360 is a standard license off the 2GB of online storage. Setting up your computer: Easy to adjust key parameters of Windows. Frees memory or remove unnecessary information from your hard drive, the computer worked quickly and flawlessly. Norton Identity Safe: Protects remembers and automatically enters your logins and passwords to log on to Web resources. At present, includes an online version that allows you to use the stored registration data on different computers. • Parental Control: Allows you to track the activity of your children on the Internet with Norton Online Family, so that you can protect them from online dangers. Norton Bootable Recovery Tool: Creates emergency bootable CD / DVD or USB-device, allowing to recover your computer after infection with malicious threats, in which the computer can not be started. • Web access to the backups: Norton 360 allows you to upload and share photos, videos and other information that was added to the online backups at any time, anywhere via a password-protected Web page. Network Threat Protection: Detects network threats before they reach your computer.